This vegan blueberry banana bread is moist, super easy to make and not overly sweet. Plus, it’s made with heart healthy, wholesome ingredients! Preheat oven to 350 degrees F. Grease a 9 x 5 loaf pan lightly with oil. Combine: In a medium sized mixing bowl, add the flour, oats, baking powder, baking soda and pinch of salt, stir to combine. Mash the bananas by hand in a small bowl, using the back of a fork or slotted spoon. Mix: To the dry ingredients, add the mashed bananas, oil and plant milk, mix to combine, just until the flour is incorporated. Best practice for mixing quick bread batter: Don’t overmix, as overmixing the ingredients will cause the gluten proteins to create an elastic batter that will not rise well. Pour the batter into a lightly greased 9 x 5 loaf pan. 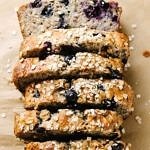 Optionally, add a few blueberries strategically to the top and sprinkle a small handful of oats over top. I added quick oats, but old fashioned oat would look nice too. You can also chop old fashioned oats into smaller pieces. Bake: Place loaf pan in oven and bake for 50 – 55 minutes, rotating the pan once halfway through. Top will turn golden and toothpick placed in the center will come out clean. Once done, let cool for 15 minutes in the pan. You should be able to tilt the pan and the loaf will come out clean, place on rack to cool completely. Store covered on the counter for up to 3 days or in the refrigerator up to 1 week. Keep in the freezer for up to 3 months – place completely cooled loaves in freezer containers or bags. Thaw the wrapped loaves overnight in the refrigerator. I found this bread to be great as is, without any of the optional add ins, but I’ve added them as an option to keep it varied and versatile. If by chance your batter is on the dry side, this can happen when using all-purpose or whole wheat flour, you will most likely need to add a little extra non-dairy milk, about 3 – 4 tablespoons will do. If you don’t have baking soda on hand, use 1 tablespoon of baking powder instead, it will work fine. You just may not get as golden of a top that the baking soda would add.